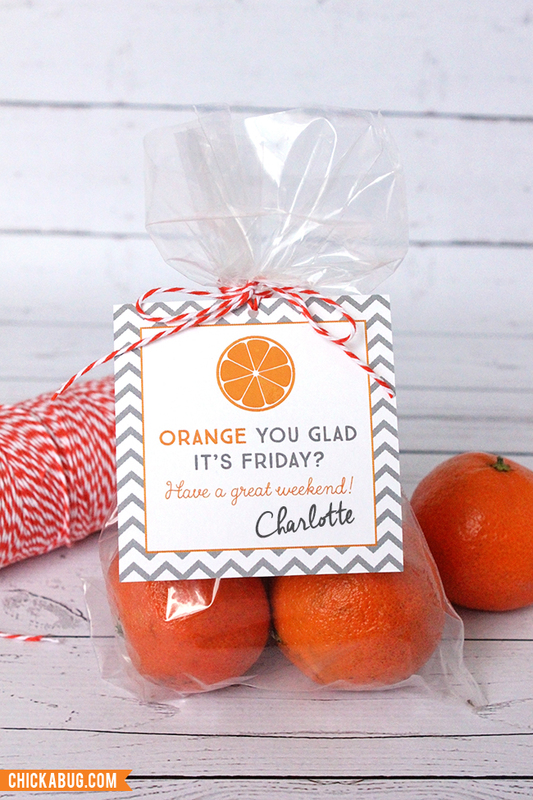 “Orange You Glad It’s Friday” – free printables! Friday is everybody’s favorite day of the week, right?! I mean, I work every day of the week, and I still get psyched every Friday. ; ) It’s just a magical, awesome kind of day. Let’s celebrate it with a fun free printable that you can use to make some “just because it’s TGIF” gifts! These make great little presents for teachers, co-workers, friends, neighbors… anyone in your life who could use a happy little surprise (and who couldn’t?). I left space on the tag so you can sign your name, or your kids can sign their names. PS. Need favor bags? Grab some here! This is so cute. Can't wait to use with our Social Club at school. 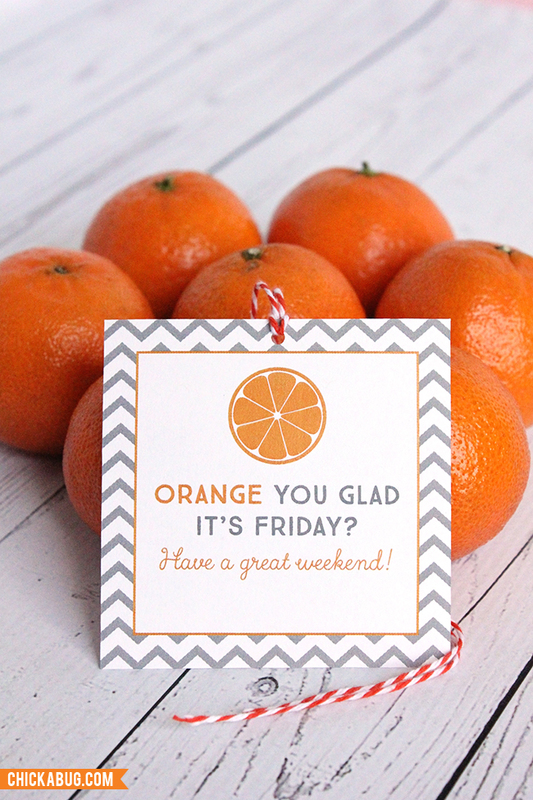 Please send me the orange you glad its friday printable. Hi Lauri, I added you to my list. Thank you! I'll add you to the VIP list. You'll get an email from shop (at) chickabug.com. Thank you! So cute! Going to use for coworker gifts! Thank you. Can't wait to use these! Thanks :) I can't wait to share this with my secret pal! Please sign me up for your VIP list. Would love the Orange printable. Super cute! Cant wait to see what else is in store! Please send me the "orange you glad' printable. Thank you so much! The link is not working after I signed up to print this. Hi Amanda! It's working for me. Can you please try again? Could I please get a copy as well! Hi Ashley! When you joined the VIP list you got a message from shop(at)chickabug.com. Look for that or search “Chickabug” in your email and it will come up. The email has the link to the free downloads. I hope this helps! Please send me this cute printable! 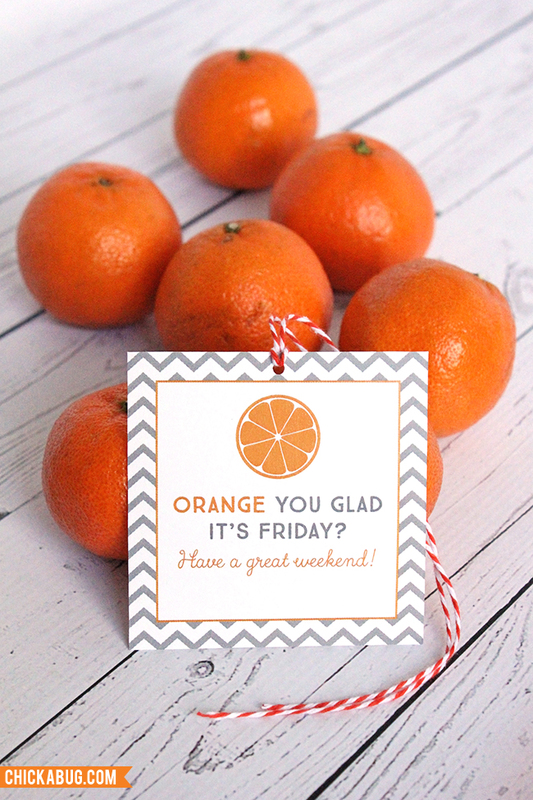 I am looking on your website for this "Orange you glad it's Friday" tag and cannot find it. Hi Kristin! Please follow the instructions under the big pink "How To Download" banner that's in the post. Love the idea really excited! This is a super cute idea for Friday. Too cute! Can't wait to print this. 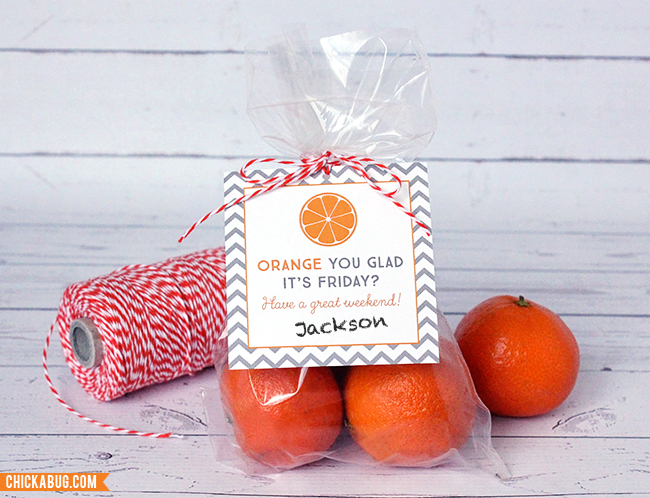 Please send me the orange you glad it’s Friday printable. Thank you!! I'm putting on the Associate Appreciation Week's activities next month and I love this idea! I have subscribed. It sent me an email, came to this link again from it but I am not able to download the printable yet. Can you please help me? cute printable labels. Thanks for sharing! Hey , I subscribed I did not receive the free printable link. Love the Orange its glad its Friday one! Super cute!! Can't wait to download! I don't see it in my email yet! Thanks so much for sharing! !